Few, if any, environments are free of human intervention. Often this generates ecosystems which are rich in biodiversity, historical interest, recreational opportunity and scenic beauty just as worthy of conservation as the more natural ecosystems on which protection programmes have been almost exclusively focussed. These 'cultural landscapes', ranging from the farm and forest lands of Europe and Eastern North America, through to the pasture lands and savannas of the Middle East and Africa to the paddylands of the Pacific Rim, are usually the product of relatively low-level, sustainable exploitation of the environment over long periods of time. Many have survived for centuries, if not millennia, but now urban expansion, depopulation of rural areas and, most damagingly, the intensification of agricultural and sylvicultural practices, are everywhere leading to a loss of their cherished biodiversity and amenity. Whilst past changes have mostly added to the valued characteristics of these landscapes, modern farming and forestry are creating sterile monocultures on the better land whilst marginal lands are being abandoned. 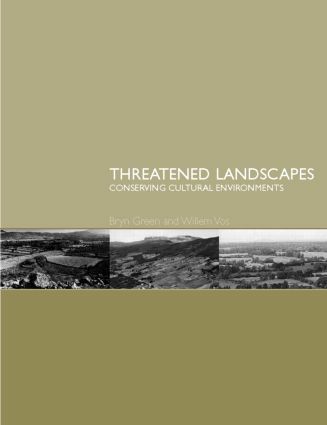 This book documents these changes, illustrates them through detailed case studies of a representative selection of threatened landscapes, analyses their underlying causes and explores ways by which they can continue to be maintained, or new landscapes created which maintain their desired characteristics. Part One: What are landscapes?